Yet another small cool front has moved across South Floruda and the Fort Lauderdale fishing conditions while flat calm for a couple of days have now once again deteriorated from post card perfect to a good amount of cloud cover and a bit of wind as well. Seas this morning are in the 3 to 5 foot range and while not unbearable it is on the sporty side out in the blue water. Some good catches this week coming off the moon. A good amount of Wahoo taken in water less than 200 feet in the vicinity of our inlet. Decent Kingfish mixed in as well as they prefer water less than 200 feet so when we fish those depths there is a good chance for the kings to take a bait as well. Live baiting has been the ticket for the Wahoo with a small Bullett Bonito being at the top of the list of preferred baits. The majority of the Wahoo this week holding over or very near wrecks. It is nice when they do this as it makes for a small circle to concentrate our efforts. A lot of Wahoo are take here by trolling but live bait has been best by a good margin late this moon. Regular sized Kingfish available on most days but the daily catch rate has begun to become erratic. Some Sailfish as you see in the catch and release photo of this big boy who took a live Bonito loaded up with hooks intended for a Wahoo. 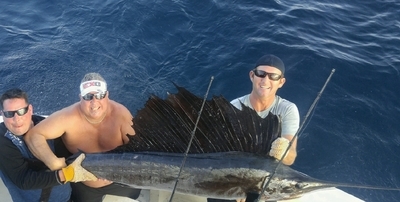 Sailfishing has a much better chance for a bite and then a better hook up ratio with a bait carrying a single hook, but that didn’t slow this one down. Snapper fishing is reasonably good and some big Amberjacks continue to be available on wrecks. Occasional Blackfin and Skipjack Tunas off the edge. A few Mahi-Mahi this week and hopefully that will continue as we all like the fish so nice they named it twice. Always good to see some of them around.